Calculate VSWR and Return Loss from Zload (or Yload) and Zo. 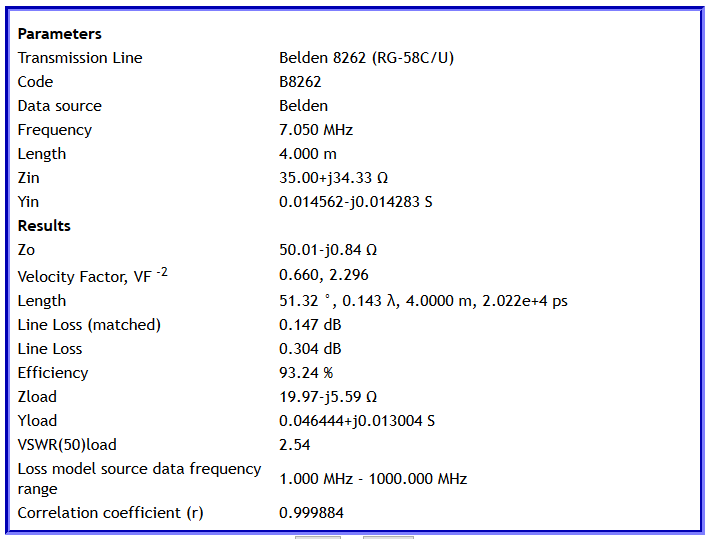 Feed line is 4m of Belden 8262 (RG58C/U). Above is the short results output from TLLC, calculated load impedance (ie feed point impedance at 7.050MHz is 19.79-j5.59Ω. 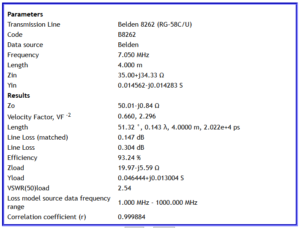 This is credible, the antenna is resonant around 7.070MHz depending on proximity to structures. The nominal Zo of RG58C/U is 50Ω. The measured Z would be normalised by dividing by the nominal Zo (50) (Z’=0.7+0.6866) and plotted on the chart. Let us use a calculator to find the complex reflection coefficient Γ at that point. You would draw an arc of 51.32° electrical on the chart towards the load, the angle of at the new point would be 91.61+2*51.32=194.3=-165.7°. The new Γ then would be 0.4087∠-165.7°. We can now use a calculator to give a more precise value for Z than reading from the chart. 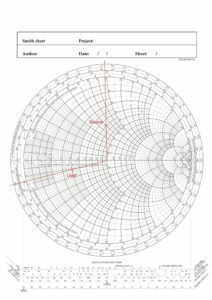 So, we would read a normalised value that when multiplied by 50 would give Zload=21.3-5.2Ω and if you were very accurate in your plotting, that is the value you would expect to find from the Smith chart method assuming lossless line and nominal Zo. This does not reconcile exactly with the TLLC report, but it is fairly close. Assuming Zo of RG58C/U at 7.05MHz to be 50.01-j0.84Ω and the matched line loss (MLL) of 4m of line to be 0.147 (both figures from the TLLC snapshot above), we can perform a fuller Smith chart procedure. 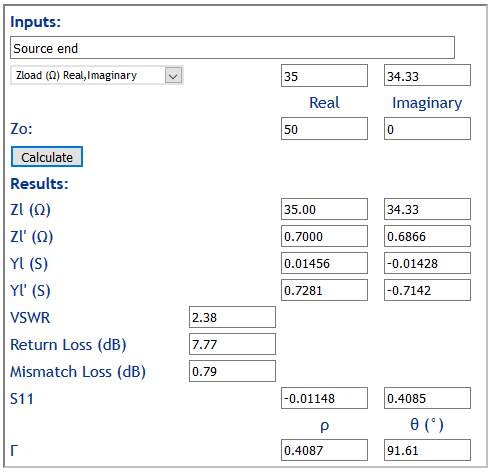 The nominal Zo of RG58C/U is 50.01-j0.84Ω. The measured Z would be normalised by dividing by the nominal Zo (Z’=0.6881+j0.6980) and plotted on the chart. To account for line loss, we cannot simply draw an arc as in the last case, it is in fact a spiral and it is only the end point that is needed so we will find that end point graphically. The radial of the end point is 51.32° electrical towards the load, so you would draw that radial on the chart. The magnitude of Γ must be adjusted by twice the MLL. The graphical procedure for the adjustment is to use a pair of dividers to lay off the radial on the ReturnLoss scale and read off the ReturnLoss. Above is a magnified section of the ReturnLoss scale, the ReturnLoss at the source end should plot to 7.6dB. You would then reduce the divider point by 2*0.147=0.297dB to 7.3dB. Yes, you have to interpolate by eye, it is a little challenging. Now lay that distance off from the centre on the radial for the load end point and plot the point. The angle of at the new point would be 91.61+2*51.32=194.3=-165.7°. and adjusting the magnitude of Γ, ρ=0.4185*10^(0.147*2/20)=0.433. The new Γ then would be 0.433∠-165.7°. So, we would read a normalised value that when multiplied by 50 would give Zload=19.96-5.63Ω and if you were very accurate in your plotting, that is the value you would expect to find from the Smith chart method taking into account actual Zo and line loss. 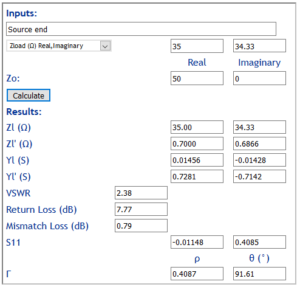 This value is very close to the value shown in the TLLC snapshot (given rounding errors in some of the calculations along the way). TLLC produces a solution that fully considers the actual Zo and loss characteristics of the line section, and rounding errors are minimised as all internal intermediate values are carried at high precision. Calculations using Calculate VSWR and Return Loss from Zload (or Yload) and Zo to simulate Smith chart plotting produce fairly close answers for the nominal Zo lossless method, and very close answers when actual Zo and line loss are modelled. 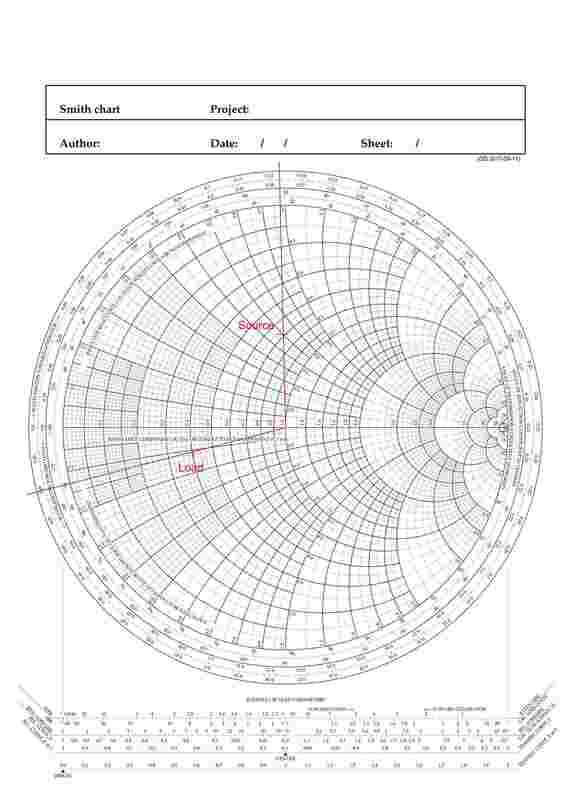 Considering the uncertainty of inputs, the simpler Smith chart process is usually accurate enough and plotting is usually of greater uncertainty.